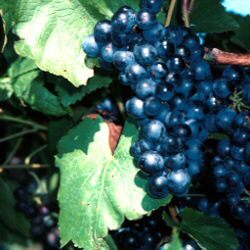 Buy Black Hamburgh Vine Bush (Vitis vinifera 'Black Hamburgh') Online Indoor Grape Variety Pack. Black Hamburgh (Vitis vinifera 'Black Hamburgh') is a well-known grape variety, largely because of its link to Hampton Court. It is an excellent grape variety, producing medium-large, black-blue grapes. This variety is recommended for a warm greenhouse situation. Vines, however, will commonly do well in a cool greenhouse, especially given a very sunny, sheltered situation. A reliable and excellent quality sweetwater black grape, Black Hamburg produces large bunches of appealing grapes. We will include a message card included at no additional cost if required. Dear Senior Dogsbody - alias Alan , I shall endeavour to be as honest as I can about your trees. Firstly I have quite a little collection of your " offspring " planted firmly and as far as I can tell, happily in my garden. Pears and apples blossom and produce exceedingly well but my favourite is the truly splendid and spectacular Mulberry. She is without doubt in a class of her own. Majestic in the centre of a large garden she has produced fruit from her first year three years ago. Each year her fruit have increased in volume and size, this year being her best. The fruit have a lovely flavour and if picked when black and about to drop off, they are sweetest. My outdoor vine is controlled and not allowed to wander willy nilly hence it has produced an abundance of small muscadet fruit of honey sweetness. The vine is now about five years old, has a cocktail of mulches in the Spring, whereas the apples and pears get drunk as newts on their annual bottle of cider each, which is why their woody limbs flail all over the place for twenty four hours afterwards. Would I purchase fruit trees from anyone else ? Certainly not ! Why not ? During the dormant season (November to March) most vines do a very good impression of looking dead. We don't mean they have arranged their own memorial and headstone but that the branches look very dry and beyond sprouting new growth. This is normal but if you absolutely must know right now, today and this instant then scratch a little bark off. If it is green underneath then the grape vine is still alive. All vines are at least 2 years old and grafted onto a root stock that will be 3 years old. This is to improve vigour (growth and fruit production). The vines are pruned back several times a year and can easily grow 1m (3ft) in a season. They might fruit in the first year, local conditions allowing, certainly the second. Bred to be Phylloxera resistant. Vines will last 100's of years if looked after and outdoor vines can be successfully grown outdoors as far North as Yorkshire (depending on weather conditions).Indoor grapes have been grown in a Greenhouse in Aberdeenshire. Give them as much sun as possible, keep ventilated and humidity down. This applies to indoor and outdoor grapes. Despite your best efforts, you will most likely encounter a Grape vine issue at some point, especially with global warming giving us wetter summers. As little as a week of continued warm and wet weather is enough for those little fungus "bar-stewards" to get in and wreak havoc. The three you are most likely to encounter are downy mildew, powdery mildew, and grey mould. Your best action is preventative. Keep the site moisture levels down. Water the base, not the leaves. Keep the leaves spread out to allow light and air in to dry them out. Vines under glass need to be well ventilated. Consider heating the greenhouse for long periods of cloudy weather to keep humidity down. If you do get it, remove the affected leaves and destroy.